No butts – stub it, bin it! Smoking related rubbish is now the UK’s biggest litter problem, with cigarette litter reported to be found on 78% of our streets. 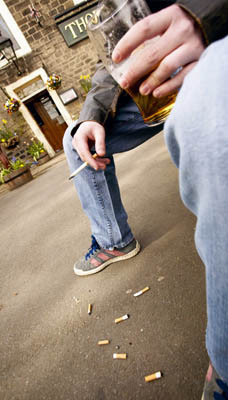 A national survey in 2009/10 carried out by Keep Britain tidy indicated that Smoking related litter is getting worse with an increase at affected sites of 5%. In 2008 Lewisham conducted a smoking related litter campaign in the borough and found 11,657 incidents of cigarette litter at 6 main sites (including town centres) We then carried out an intensive campaign and as a result, the number of incidents fell to 8,453, resulting in a 27% reduction in cigarette litter. However this is still a big issue in Lewisham and this year a survey found that smoking related litter was present on 81% of sites which were surveyed. As a result of this between the 7th and 11th February Council officers will be carrying out an Awareness raising initiative to educate people on the safe disposal of smoking related litter and to issue portable ashtrays.